In northern Brazil, underneath tropical savanna vegetation, lies the evidence of an ancient collision. Roughly 220 million years ago, geologists estimate, a meteorite struck Earth here. Despite its age, Serra da Cangalha remains Brazil’s best-preserved impact crater, resting upon largely undisturbed sediments laid down some 300 million years ago. The Advanced Spaceborne Thermal Emission and Reflection Radiometer (ASTER) on NASA’s Terra satellite took this picture of Serra da Cangalha on June 23, 2006. 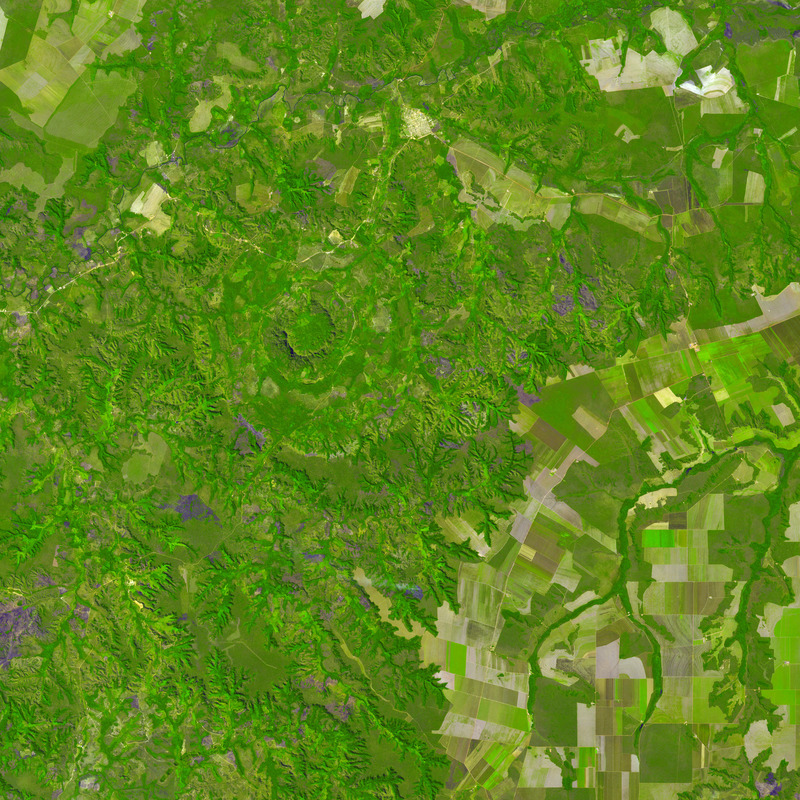 In this simulated-true-color image, varying shades of green define the local cerrado landscape—a mix of savanna and riparian forest (forests along a river or stream). Occasional patches of purple-gray indicate bare ground. Regardless of the overlying vegetation, the crater’s structure remains obvious, showing a series of concentric rings. The crater’s diameter is roughly 13 kilometers (8 miles), and its innermost bowl is rimmed by rocks rising 420 meters (about 1,380 feet) above the surrounding land. The crater walls cast shadows on the nearby landscape. Serra da Cangalha’s status as an impact crater took some time to be established. That it might be such a structure was first proposed based on several factors: its circular shape, the absence of carbonate or salt layers in nearby sediments, which would suggest a salt dome, and the fact no volcanic rocks appeared in a drill core from the crater itself. Even more definitive signs of an impact appeared in the form of shatter cones—conical-shaped, grooved rocks known only to appear in impact craters. Blocks of fossil wood have also been found in the crater’s central uplift area. Roughly 220 million years ago, geologists estimate, a meteorite struck Earth here. Despite its age, Serra da Cangalha remains Brazil’s best-preserved impact crater, resting upon largely undisturbed sediments laid down some 300 million years ago. Reimold, W.U., Cooper, G.R.J., Romano, R., Cowan, D., Koeberl, C. (2004). A SRTM investigation of Serra da Cangalho impact structure, Brazil. Thirty-fifth Lunar and Planetary Science Conference. Almeida-Filho, R., Moreira, F.R., Beisl, C.H. (2003). 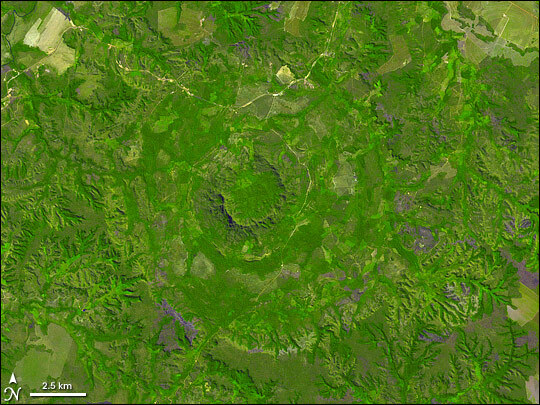 The Serra da Cangalha astrobleme as revealed by ASTER and SRTM orbital data. Int. J. Remote Sensing. 24(00), 1-6.